Kathleen Glahn owns and operates a small diversified farm just outside the historic battlefield sites in rural Gettysburg, Pennsylvania. 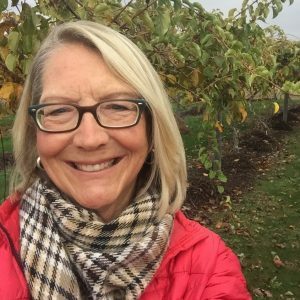 With her primary crop being hardy kiwi berries, Kathy also manages on site guest accommodations as well as cultivates an interesting crop mix to delight her overnight guests and increase farm revenue. Setting aside her own business ventures, Kathy has been very active in launching a variety of farmers’ market initiatives to increase vendor sales while meeting multiple needs of the community. In collaboration with the Adams County Food Policy Council and Healthy Adams County, these nutrition and wellness initiatives have grown by over 325% since 2011 and most recently generated a combined boost of $65,000 in annual market sales. Kathy has secured a number of funding opportunities for the Adams County Farmers’ Market Association (Gettysburg, PA) which assisted in start up support for the programming. Prior to relocating to Gettysburg, Kathy managed a sales territory in Upstate New York and successfully secured placement of products in both independent and major retail stores. In 2009, Kathy was recognized by the United Way of Adams County as an Exceptional Woman in Agriculture. Top 3 obstacles facing farmers markets: 1. Increase of savvy retailers creating stronger “”locally grown”” produce sections in their stores and offer consumers more one stop shopping alternatives; 2. Markets needs more support from local business/community & economic development corporations that can assist in providing infrastructure support to build capacity; 3. Development of community partners especially in the healthcare sector; 4. Unwilling to adapt to change. Also a board member of the Gettysburg Hospital Foundation and active member of the Adams County Food Policy Council.